after i finished eating my tomato sandwich for lunch i tucked into a nice bowl of *local* strawberries. the first strawberries i have purchased here that have been worth eating. you see, everywhere other than california is plagued with these things called seasons, and strawberries do not grow in all seasons. they hardly grow in any season here, but for now they are sweet and red and fragrant. and i am so pleased that i live a season-y life again. i always thought i missed the seasons when living out west, and now i know that i did (even if that means our produce is mostly lack luster). oh and check our terracotta bowls ... straight from el salvador by way of mas' stepmother. i love them, they scare mas as they are made from mud ... i know. are you going to grow food in your garden or stick to flowers and herbs? 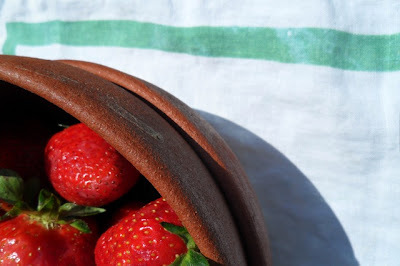 we move into our new place tomorrow and i want to start planting on our roof by next week.. but i don't think i'm core enough to grow food..
Tomato sandwiches and locally grown strawberries? We may be kindred souls! joy, we are doing veggies too, a lot of them in fact. i'm beginning to wonder if we took on too much. but herbs count as food, anything you eat counts as food if you grow it.